Food Focus: Fruits is a game designed to educate users about the wide variety of available healthy fruit options in a fun and engaging way. The game challenges players' fruit recognition capabilities and nutrient content knowledge by showing them a close-up photo of a fruit. A timer ticks down 20 seconds in which to figure out what fruit it is by pressing 1, 2, or 3 on the keyboard for the corresponding answer. 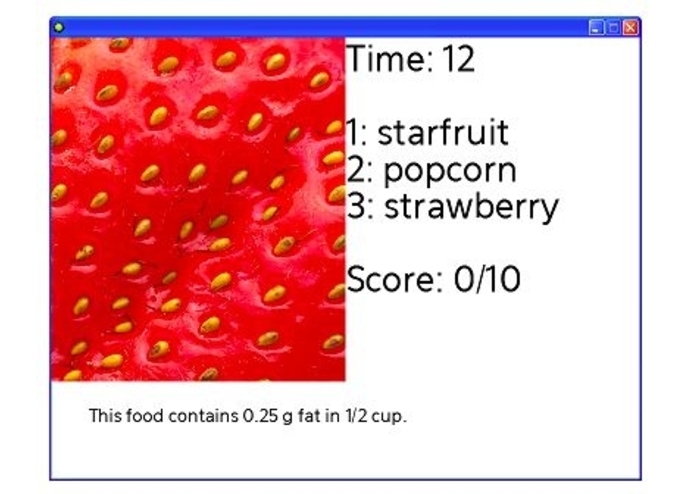 Fruit nutrient clues appear on the bottom of the screen after 5 and 10 seconds to add to the excitement and learning objectives of the game. Game scores are tallied as players progress through 10 fruit photos in a game set. Individual best or team challenges are possible. Ready to play? Food Focus: Fruits game is compatible with PCs; Sorry, not Macs. Click on link to download Food Focus: Fruits game files (takes about a minute). You may need to accept a trial version of winRAR to unzip file. Save game folder for easy replay. Click on Food Focus.exe file to begin play. When fruit close-up photo appears, the 20 second timer begins. Nutrient clues appear at the bottom of the page after 5 and 10 seconds of play. Use the 1, 2, or 3 keys on keyboard to select your answer from the three answer choices. An encouraging voice will let you know when you get a right answer. Each game set includes 10 different fruit photos. Game scores are tallied as play progresses, and final score is displayed at the end of the game.